This is a detailed study of Haygarth’s time at school. The 116 pages include details of all the house matches as well as the more important encounters with Eton, Harrow, MCC &c. and includes biographies of all the 186 players who appeared with him, with much about the history of the school. Using newly discovered Haygarth material from Lord’s and using the original scorebooks from Harrow school this provides a fascinating insight into how in the 1840s the team went about finding players who at Lord’s could beat both Eton and Winchester, schools at that time who had considerably more pupils than Harrow. David Frith provides a meaningful foreword. It is a hardback with dust wrapper in a limited edition of 100 numbered copies signed by me. The cost £25 including postage and packing. Cricket's chronicler chronicled. In this carefully-researched labour of love, Roger Heavens - Boswell where Haygarth is Johnson - traces the early career of Arthur Haygarth at a level of detail seldom devoted to any cricketer other than perhaps Grace and Bradman (possibly the same treatment will one day be given to Tendulkar). Haygarth was at Harrow between 1839 and 1843, and this book records the 73 matches he is known to have played in from his first appearance at the age of 14 for the Second XI in June 1840 to his last appearance for Harrow at Lord's in August 1843. The scores have been compiled from the scorebooks at Harrow and from Haygarth's own notes preserved in the MCC library at Lord's. While some (which Haygarth called 'matches') were major encounters which have been recorded in Scores and Biographies, the majority (which Haygarth called 'games') were internal house or practice matches played between the Harrow boys and have not previously been printed. What is perhaps most striking is the low scoring: Haygarth was frequently dismissed for single figures in these games and there is nothing to suggest that this was a boy who would go on to have a distinguished career (and would be very difficult to remove from the crease). This is more than just a survey of Haygarth's school cricket, however. 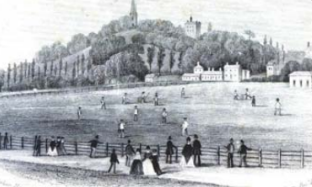 It is also a detailed snapshot of cricket and life at Harrow in the 1840s, at a time when school cricket was developing rapidly: within a few years one of the most important matches of the season was the annual clash between Eton and Harrow. Each score is accompanied by brief Haygarth-style biographies of the players involved, many of whom went on to achieve greater things in public life, or who were closely connected to the great and the good of Victorian society. The young man for whom Haygarth acted as 'fag', for example, was Robert Peel, eldest son of the Prime Minister; his younger brother appears in two matches here, and went on to have a career in politics, although he never quite emulated his famous father. William Spottiswoode, who makes 23 appearances in the book, was the elder son of the founder of publishing group Eyre and Spottiswoode. He had a shaky start to his career, being expelled from Eton for fire-raising on Bonfire Night before being admitted to Harrow, but he went on to be a distinguished mathematician who was involved with the invention of the telegraph, while his own son played a couple of matches for Kent. One of the most appealing features of the book is the careful way it replicates Haygarth's own production, Scores and Biographies. The typeset is the same, as is the layout of the pages, and each new biography is introduced on a character's first appearance alongside Haygarth, just as Haygarth introduces each new player in his drama on their first appearance on the Lord's stage. Roger Heavens even seems to have copied Haygarth's Victorian style of writing in the biographies and the commentary - the result, perhaps, of years of preparing and editing Haygarth's manuscripts for publication. The book is graced with a foreword by David Frith, who recalls his own days at Harrow Grammar School (somewhat different from the public school, as he ingenuously acknowledges). While the close focus on the early Victorian era will not appeal to all, for me this was a delight and a compelling read. The volume contains a numbered limitation page signed by me as editor and also a list of subscribers. The specification of the book is as previous volumes. It contains 806 scores (111 more than 1883) and 107 biographies, plus all the Haygarth notes which, particularly with the great matches, tell you more than the standard texts. Wisden, Green and Red Lillywhites plus Cricket: A Weekly Record of the Game have only 298 of these scores in some form with many errors and omissions – e.g. minus the bowling figures, accurate extras, &c. – including the 150 first class matches of 1884. In other words this volume offers 508 matches with scores that are not available elsewhere in printed form, including all MCC, IZ, Orleans Club and Sheffield Park matches, with all of the All England encounters. Matches involving both the Australian and Philadelphians who toured that year feature prominently. England also visited Australia at the end of 1884 and their matches in 1884 are also fully covered. Players from these teams also played in other teams as part of their preparations (and/or after the official matches were concluded) and these are all included for the first time in any publication. Volume 21 as usual has reports of the AGMs of all the Counties and MCC – which this year include the new laws of cricket (The Amended Code) which provided for the first time a result based on the first innings of a one day match and allowed 5 or 6 balls to be used for each over, although 4 remained the figure for matches of more than one day, plus many items on cricket throughout the world. The book has 686 pages – an increase of 10% since 1883. The price is £125, including postage and packing. There are only three copies left. This Volume, which covers the year 1883, is now available in a strictly limited edition of 175 copies. If you have not seen one of this series they contain in almost unbelievable detail facts and information about the history of the game. Most of the previous nineteen volumes are sold out but I do have a number of copies of Volumes I and 2 available at £5 each. If, however, you are seriously considering purchasing the latest volume but are unsure about making a final decision I am prepared to let you have them for simply the cost of the postage and packing which is £5. Please note there are only a few available as most have been sold before publication. This volume contains a numbered limitation page signed by me as editor. This is a hardback book with dustwrapper. It contains 695 scores, plus all the Haygarth notes which, particularly with the great matches, tell you more than the standard texts. Wisden, Green and Red Lillywhites plus Cricket: A Weekly Record of the Game have only 270 of these scores in some form – e.g. minus the bowling figures, extras, &c. and with several errors – including the 111 first class matches of 1883. In other words this volume offers 425 matches with scores that are not available elsewhere in printed form, including all MCC and IZ matches with all of the All England matches (including one of the elusive Skegness games that should have been in a previous volume). Volume 20 also has reports of the AGMs of all the Counties and MCC, plus many items on cricket throughout the world. Interestingly it also includes the draft laws of the game for the 1884 season. Importantly in this instance also three unpublished 18th Century scores involving Marylebone, White Conduit and Berkshire with Harris, recently discovered and exclusively made available to this Haygarth volume. There are also 112 biographies of players when they first appeared. The book has 651 pages, similar to the previous volume, and its price is again £110, including postage and packing. Volume 19 of S&B has 661 scores, plus all the Haygarth notes which, particularly with the big games, tell you more than the standard texts. Wisden, Green and Red Lillywhites plus Cricket A Weekly Record of the Game have only 210 of these scores in some form – e.g. minus the figures for bowling, extras, etc. and with several errors – including the 137 first class matches of 1882. Volume 19 also has reports of the AGMs of all the counties, plus items on cricket in the US and Australia. Both games in Ceylon are there – the England players were travelling to Australia when their ship collided with another and had to berth in Ceylon for repairs. The first ever match in Columbia is also included. As such, there are 451 matches with scores that are not available elsewhere in printed form, including all MCC and IZ games with all of the All England games (bar Skegness, which I cannot locate although the score is printed). A few are on CricketArchive – but less than 10 percent, I would say. There are also 83 biographies of players when they first appeared. Electronic copy available for £30. You can then print a copy and get your binder to turn it into a perfect bound book. Volume 18 has 551 pages and 12 pages of errata and addenda to previous volumes. It contains scores of more than 550 matches from 1881 with biographies of 77 players who came to note that year. This book, which has a dust wrapper, was limited to 175 copies and lists 148 of the subscribers who made it possible. Signed by the editor. Again the Haygarth manuscripts from Lord’s provide the majority of the detail but also, with the aid of modern communication, it has been possible to research more details of games where Haygarth only had scant information. The laws of cricket for that year are included together with an extensive bibliography of the books used to check some of the information, however, 80% of the scores have never been published in book form before. This volume continues Rowland Bowen’s intention of completing Haygarth’s “Museum”, as he called it, and takes the series to the end of 1880. There are details of almost 575 matches, the majority of which have never been published until now together with over 80 biographical entries. There are also errata and addenda to previous volumes which include a newly discovered game of importance from 1874, involving Pooley’s New All England XI which, had Haygarth been aware of it, would certainly have been included. Matches abound from the Antipodes, Africa and the Americas. There are also some surprises with references from the Asian continent. As you might expect, all the M.C.C. scores are within the book, together with most of the warm-up games played by the counties together with every Australian encounter during that year including all supplementary matches. There are also details of the eventually abortive Canadian tour when the captain was arrested by the British military for desertion in an earlier life. His escape and recapture are all dealt with! Matches involving the Band of Brothers, the Cambridge and Oxford Colleges, the great schools, the forces teams, and eccentric teams such as I Zingari, Free Foresters, Orleans, Will o’ Wisps and Incogniti abound. The general meetings of the counties are covered together with the laws of cricket for that year. Teams that failed to trouble the scorers together with others that batted so long the opposition never got a bat are all there in yet another fascinating trawl through the sport in this Victorian year. The layout of the new volume will match the previous books to preserve the Victorian feel, which I feel is important. Customers who would prefer their copy ‘in the sheets’ so that they can bind them to their own custom design can also be supplied if requested. If you require a specific number of your copy of the limited edition please state. As usual an index will be available. The cost of this volume will be £65 plus £5 postage and packing and the index if required an additional £8. Its layout will be as in all previous volumes. The 16th Volume of Scores and Biographies covers 1879 and has all been taken from Haygarth's original manuscript, kindly loaned to me by the M.C.C. It contains 472 scores, most not previously published, 142 biographies and obituaries together with 22 pages of errata and addenda from Haygarth's own notes, and a continuation of his Curiosities of Cricket. This 535 page book is in identical format to the previous volumes and is supplied with a dust wrapper. This was probably the most important historical publication of the last few years and I am sure that Haygarth himself would appreciate the new work. The books, which cover the period 1744 to 1879, have never been fully indexed until now. If you are interested in the period and need to find information, mostly unpublished elsewhere, this series of booklets should prove invaluable. Much of the work is devoted to club and town cricket. For example, 1861 details 205 matches of which only 37 are printed elsewhere and, of the 50 biographies that year, 44 are unique. Designed to locate all entries quickly via cross-referencing, the index has 100,000 plus entries. Published by the Association of Cricket Statisticians and Historians in 2003. Part of the Famous Cricketers Series (No. 75) this also contains a listing of the averages of Haygarth’s contemporaries of the period of his career with a bibliography of his writings. 30pp. with 2 illustrations. Originally published in 2000 on the occasion of a commemorative plaque being unveiled by David Frith on the house where Haygarth was born in Hastings such has been recent demand it is now available again. This contains a number of biographical essays by F.S. Ashley-Cooper, W.A. Bettesworth, J.A.H. Catton, G.D. Martineau and Roger Heavens together with short biographies of the writers by Roger Packham. A second collection of essays this time by Rowland Bowen, A.J. Gaston, E.V.Lucas and two others who never gave their names. Published for the unveiling of the plaque at 88 Warwick Way, Westminster where Arthur Haygarth died on 1st May 1903 by Christopher Martin-Jenkins on 13 November 2003. Roger Heavens was born in 1948 in East Ham, London. His paternal grandfather used to tell him about watching Ranji batting at Hastings and hitting the pavilion clock. After moving to Sussex, aged seven, Roger developed a lifelong love of cricket.